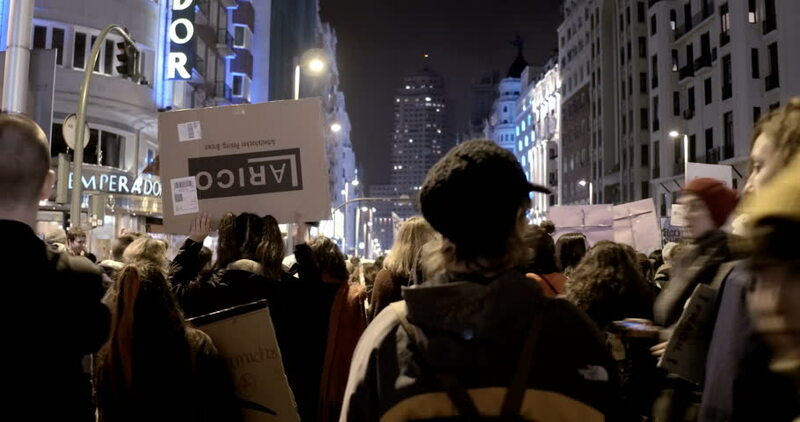 feminist strike on the international day of women in Madrid, Spain. Filmed on March 8, 2018.
hd00:22NEW YORK - FEB 15, 2016: tourists on camera looking at Revlon ad screen - snowing Times Square night NYC. Cold winter conditions don't deter tourism in Manhattan during the holiday season. 4k00:15ABERDEEN SCOTLAND - 29 November 2015: Crowded people and The Christmas parade on the Union Street in Aberdeen, Scotland, to celebrate the upcoming Christmas on 29 November 2015.